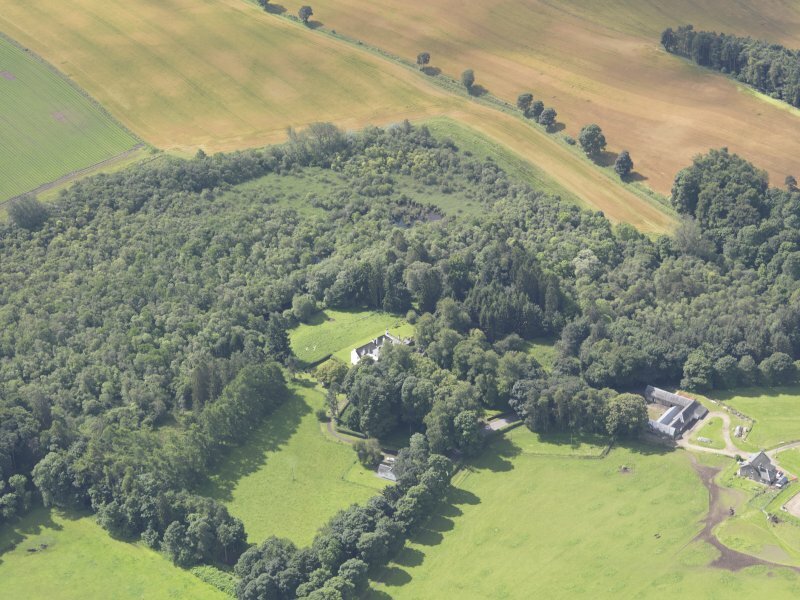 Oblique aerial view of Ardblair Castle, taken from the S.
Oblique aerial view of Ardblair Castle, taken from the NW. 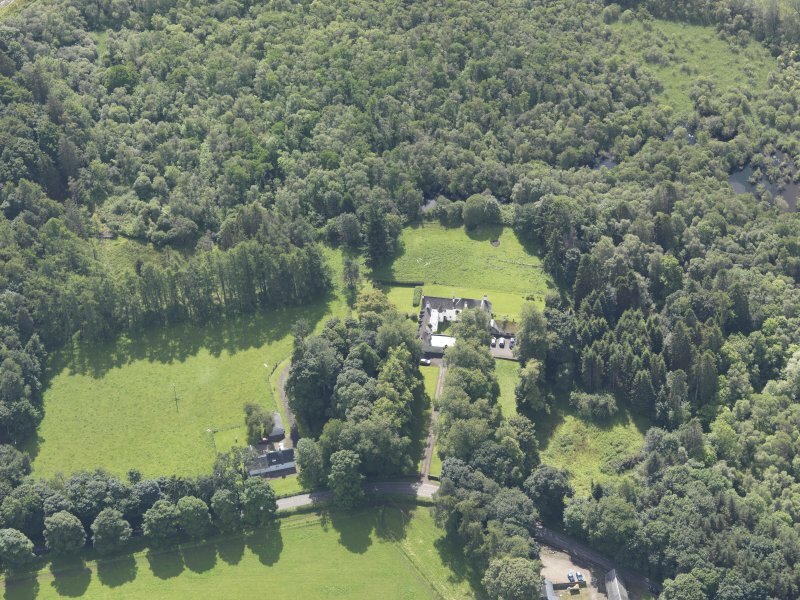 Oblique aerial view of Ardblair Castle, taken from the N.
Ardblair Castle, Tower House Oblique aerial view. 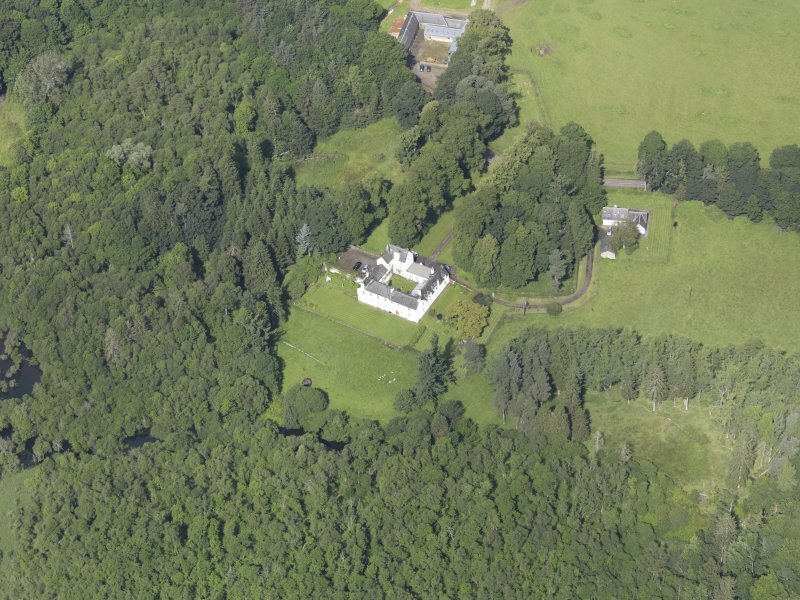 Oblique aerial view of Ardblair Castle, taken from the SSE. 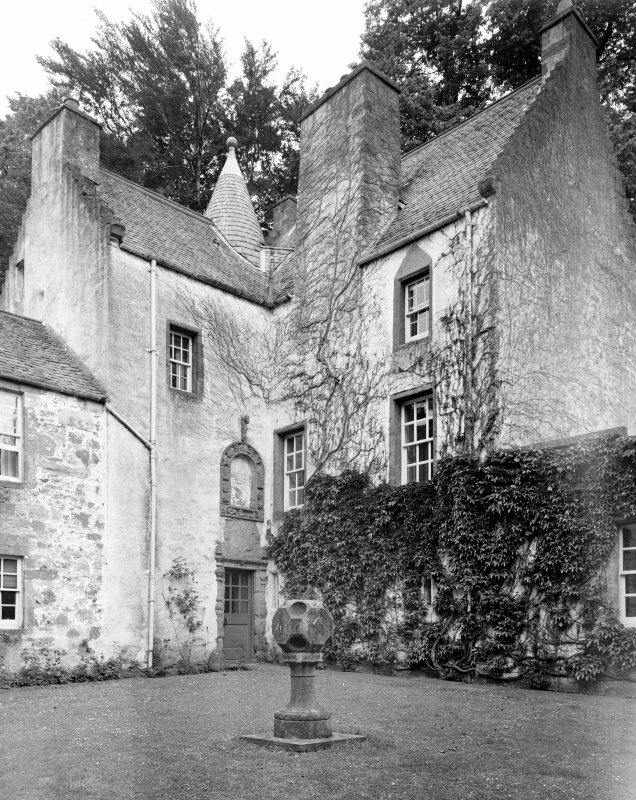 Ardblair Castle, Tower House Courtyard from South-East. 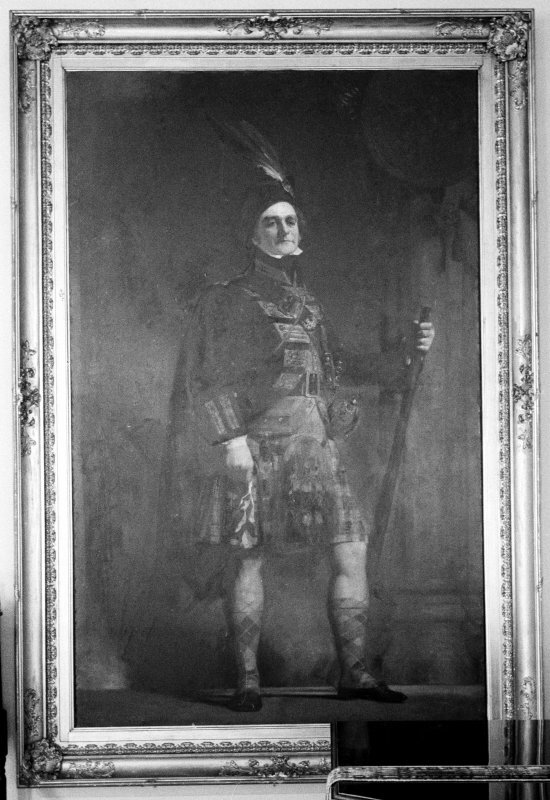 Ardblair Castle, interior View of Watson Gordon's portrait of James Gillespie Graham. 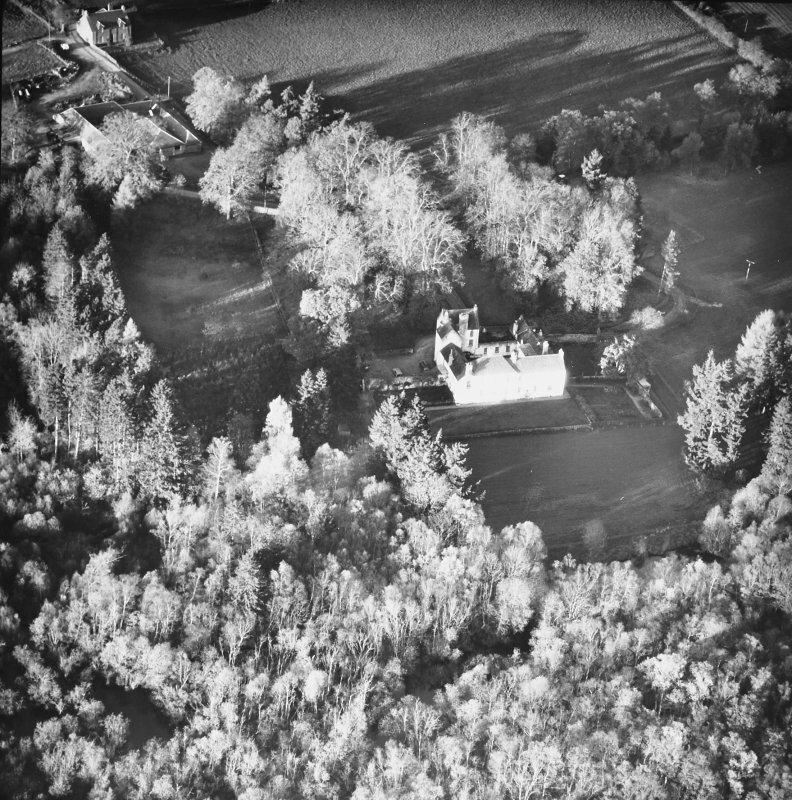 Ardblair Castle. Tower from NW. 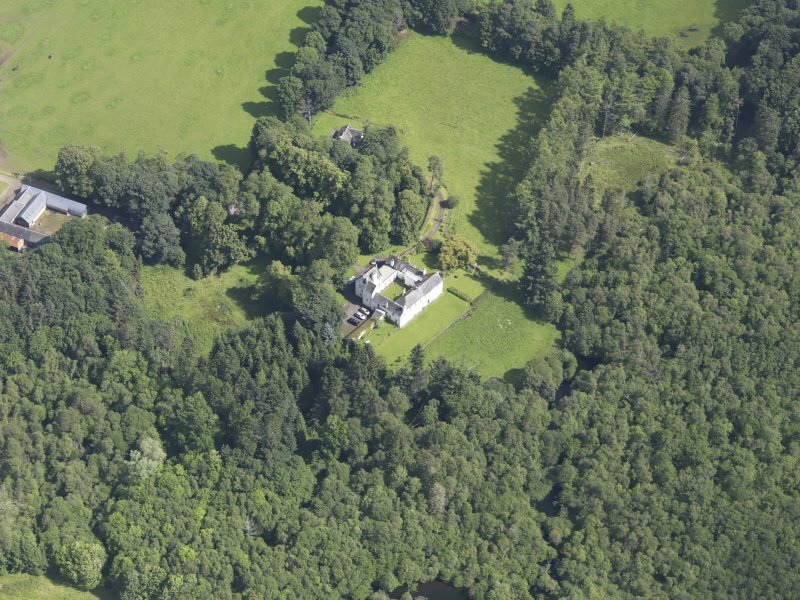 Oblique aerial view of Ardblair Castle, taken from the NE. 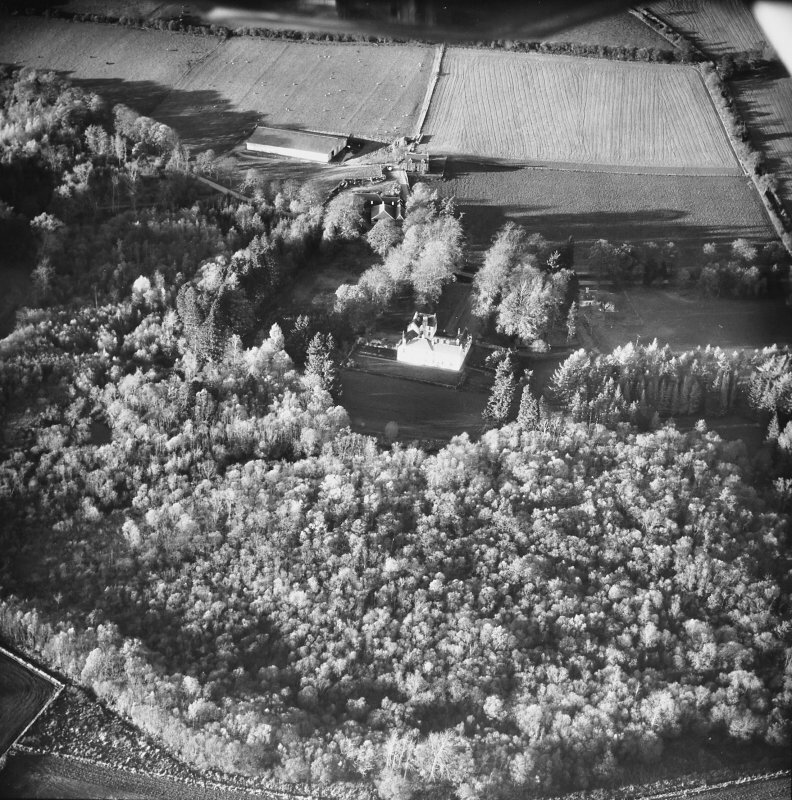 Oblique aerial view of Ardblair Castle, taken from the SE. 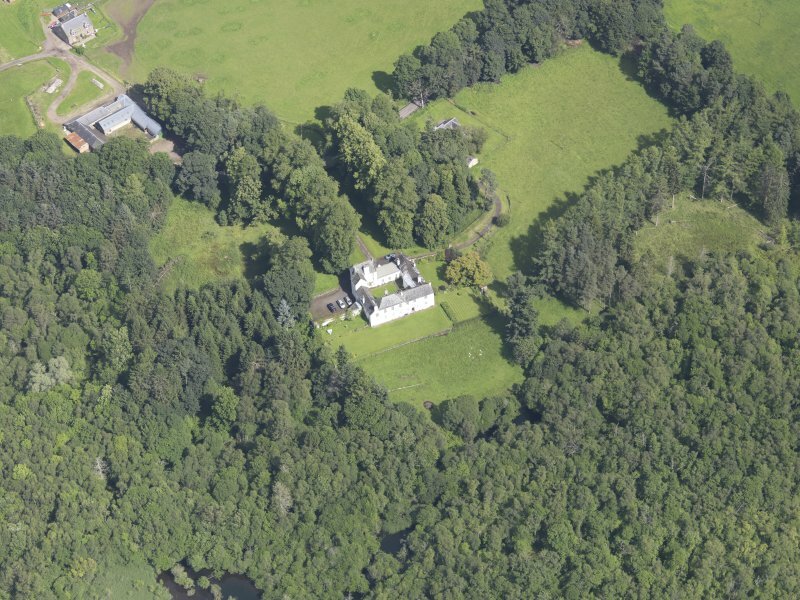 Oblique aerial view of Ardblair Castle, taken from the WSW. Ardblair Castle. Tower from NNE. 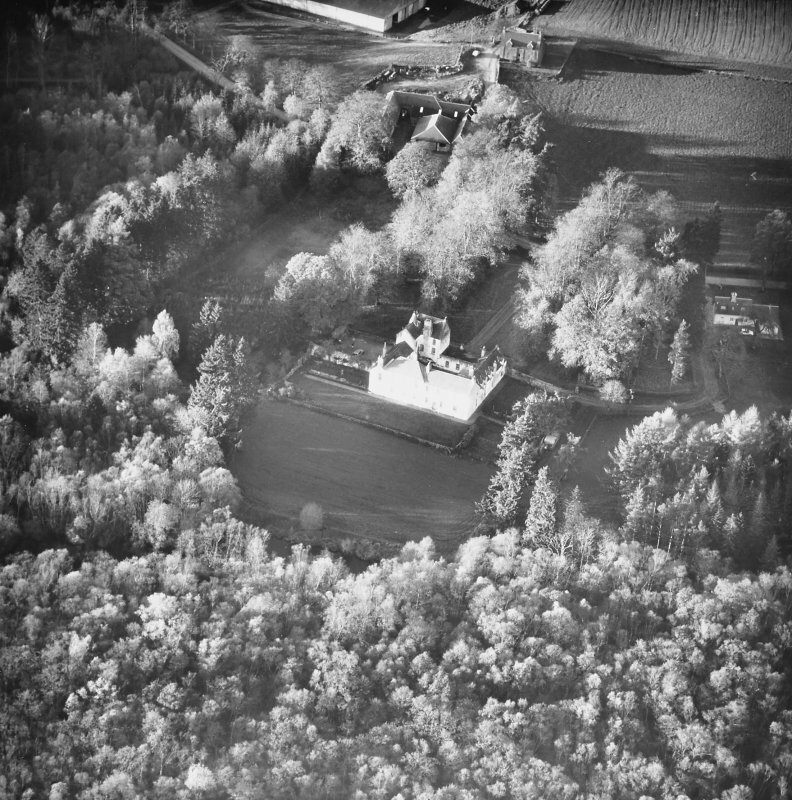 Ardblair Castle. 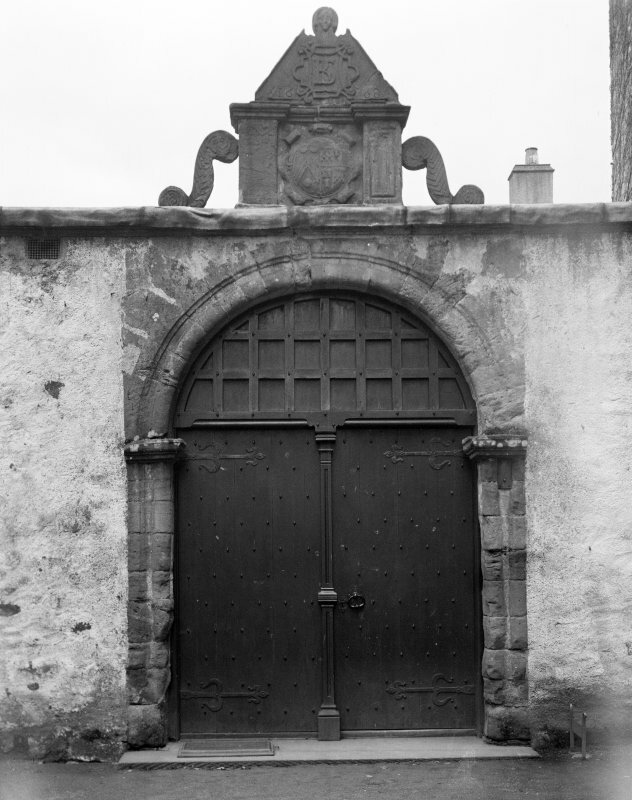 Old entrance into court. 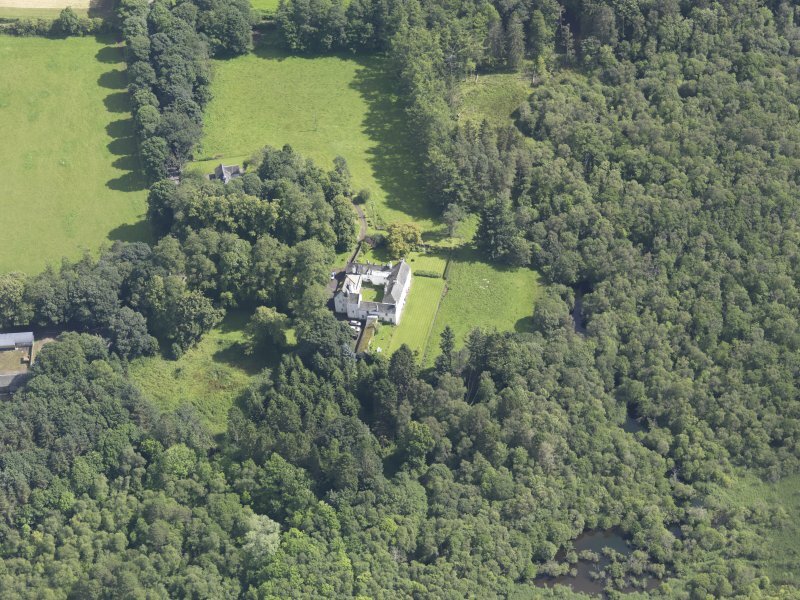 Ardblair Castle has been little altered externally since its erection and retains the courtyard form so popular in the 16th and 17th centuries. Origninally it was a strong place and was once almost surrounded by a loch, now largely drained. The earliest part of the building is a tall L-planned fortalice forming the N and W corner of the courtyard. A heraldic pediment bears the date 1688 but Tranter considers the work to be earlier and more typical of the late 16th or early 17th century. 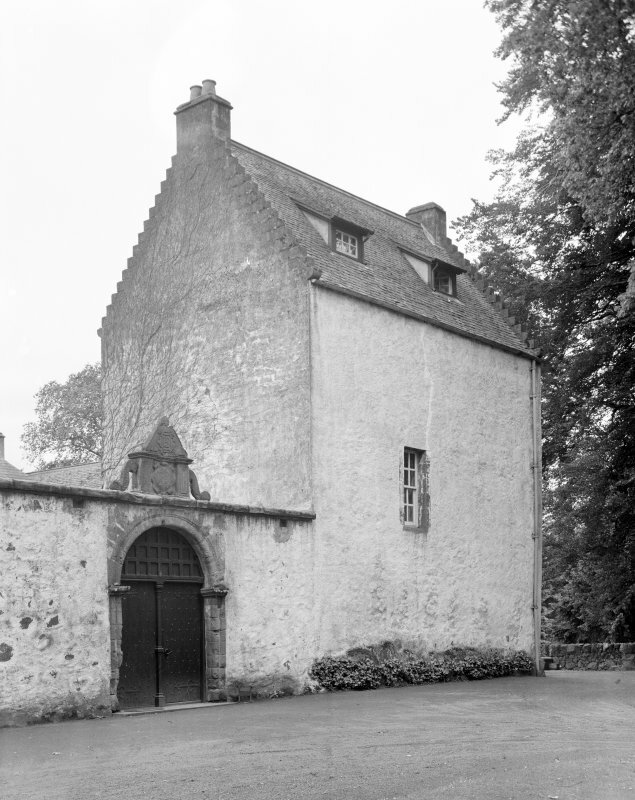 The oldest part of Ardblair Castle is clearly that at the NW corner of the present building, and the gateway bearing the coat of arms with date 1688 mentioned by Tranter. At the NW corner of the courtyard is an ornamented doorway with a much weathered coat of arms; above and over this is an alcove ornamented with allegorical figures. In the centre of the courtyard is a sundial bearing the date 1623 and with 25 dials. The original castle was built by the Blairs during the Norman period, on the site of a fort. The fortalice at the NW corner is built on the foundation of part of the earlier castle. 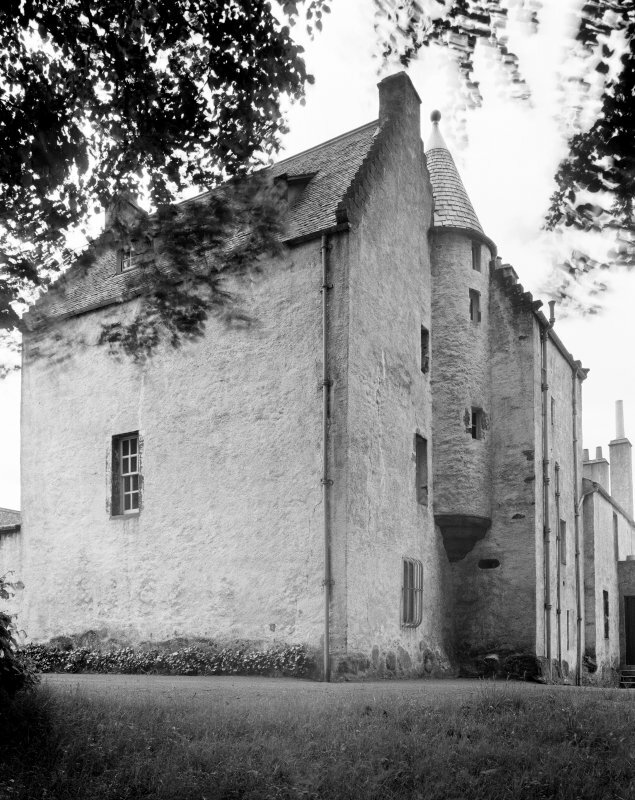 This L-plan tower-house, which is probably of late 16th- or early 17th-century date, occupies the NW corner of a courtyard, with later ranges (17th century and later) on three sides, and a screen-wall on the N, the latter incorporating an arched gateway surmounted by a pediment dated 1688. 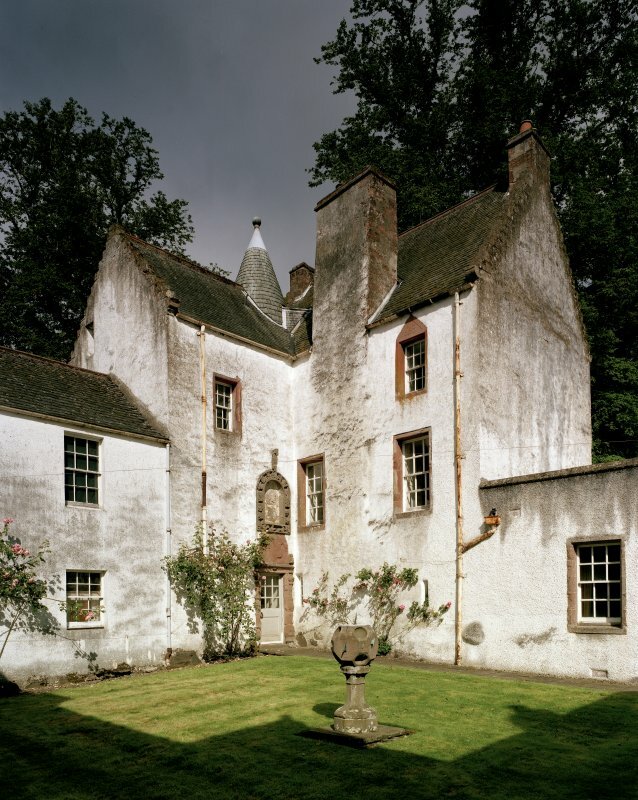 The tower stands three storeys and an attic in height and, although remodelled, retains some original detail including, in the re-entrant angle, a fine pedimented Renaissance doorway and armorial niche (with lavishly-decorated margin and unicorn finial). Tranter interprets the boulder-footings of the tower-house as the remains of an earlier castle. A polyhedron dial-head (1623) is set on a modern pedestal within the courtyard. 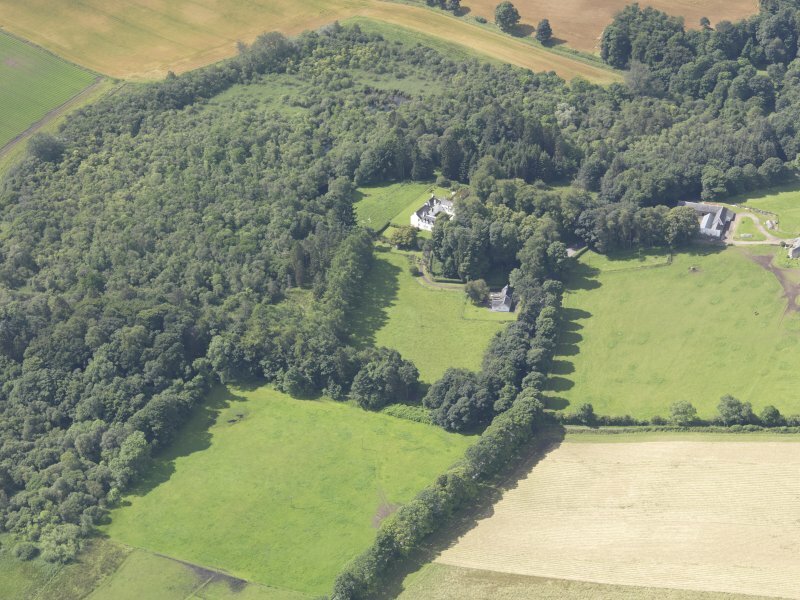 In the reign of Robert III (1390-1406), the lands of Ardblair were granted to Thomas Blair of Balthayock, remaining with his family until 1792, when the estate passed to the Oliphants of Gask. Visited by RCAHMS (IMS) 18 April 1989. Reg Mag Sig; D MacGibbon and T Ross 1887-92; N Tranter 1962-70. ARCHITECT: Mills & Shepherd - alterations 1955.